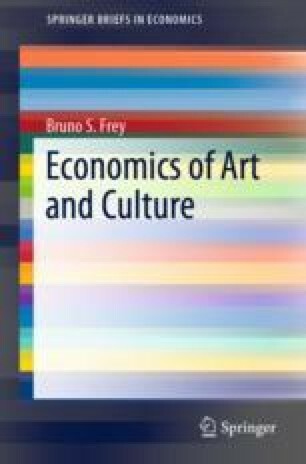 What Is the Economics of Art and Culture? The economics of art and culture is a fascinating and worthwhile subject. Its analysis is based on the economic way of thinking. It deals with a large number of diverse issues, such as how valuable art is to society, how the art market and auctions work, the specific characteristics of artists’ labour market, and the role of copies and fakes in art. Various areas of the arts and culture are analyzed, such as opera and theatre, festivals, films, museums, cultural heritage and cultural tourism. Finally, various aspects of the public support for the arts are studied, and it is shown that art makes people happy.